Kilearnadil is not a name you will find on the current 1:50,000 Ordnance Survey map of Jura. Three quarters of a mile north of Craighouse and a little inland from the road up the east coast of the island is the tiny settlement of Keils. A couple of hundred yards walk up the glen from Keils is what the map shows as a burial ground. 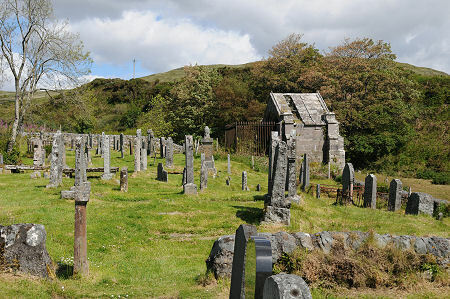 This is Kilearnadil and the graveyard here has always been, and remains, Jura's main burial ground. In the tranquil surroundings of a sheltering glen on three sides and with superb views east out over the Sound of Jura to the Kintyre peninsula and, beyond it, to the mountains of Arran, there can be few more attractive last resting places anywhere. The settlement of Kilearnadil declined during the 1700s, while that at Keils grew. By some accounts the last residents of Kilearnadil succumbed to plague and confined themselves to their houses in order not to infect the residents of Keils, who kept them supplied with food. When the food was no longer collected it was clear that all those at Kilearnadil were dead, and their houses were pulled down around them to effect burial without contact with the bodies. The area was then consecrated. The church that had stood at Kilearnadil was replaced by the current Jura Parish Church, which was completed in 1777. You approach Kilearnadil up a track beside a small stream. Entry to the graveyards is via steps leading up to a relatively recent southern extension, which in turn leads through to the original part of the graveyard. This is dominated by the Campbell Mausoleum, built in 1838 on the eastern side of the graveyard by the architect William Burn. The mausoleum is home to a number of grave slabs and tables mounted on the walls, some from as early as the 1600s, and all commemorating members of the family of the Campbells of Jura. 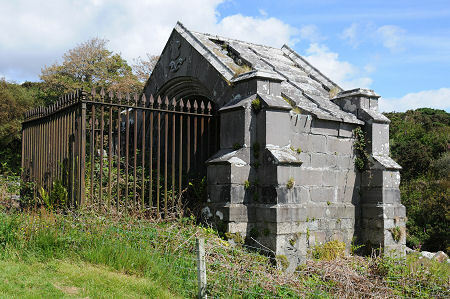 The front of the mausoleum is enclosed by iron railings, but today there is also a surrounding fence, intended to keep visitors clear of what is sadly an obviously decaying and potentially unsafe structure. 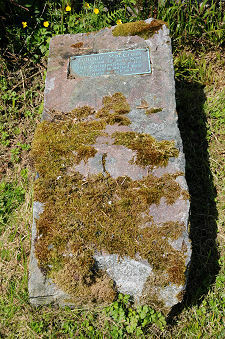 Towards the south west corner of the graveyard is a large stone carrying a plaque commemorating Gillouir MacCrain who, according to Martin Martin, writing in his 1703 book A Description of the Western Islands of Scotland "lived to have kept one hundred and eighty Christmasses in his own house. He died about fifty years ago, and there are several of his acquaintances living to this day, from whom I had this account". The general view is that the islanders were pulling Martin Martin's leg, playing on different dates on which Christmas was observed and, perhaps, implying that Gillouir MacCrain was actually 90 when he died. On the other hand this was a remarkably long living family: the graveyard at Kilchianaig near Inverlussa is home to the grave of a descendent of Gillouir, Mary MacCrain, who is claimed to have died at the age of 128 in 1856. 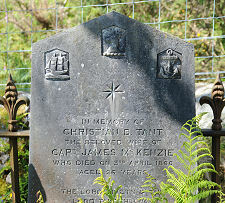 There are a number of other interesting gravestones at Kilearnadil. Several early grave slabs of the West Highland style dating back to the 1300s or 1400s can still be found in situ, some carved with depictions of swords, one of the common motifs on this type of grave slab. 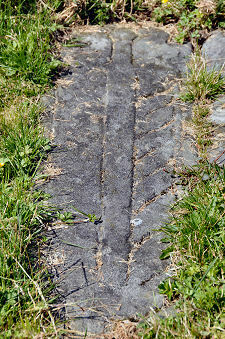 Elsewhere, a number of graves carry emblems indicating their occupants were mariners or related to mariners, while that of Alexander McIsaac, who died in 1811, carries carvings of dividers and set square, indicating that he was a carpenter. There is also a broken immortelle, now minus the glass dome that would once have covered the small statue. Seat In Memory of "Donald"